I have just rolled off of my project of the last 8/9 months, and thought it was a good point to reflect on my time there. Once again I had an awesome time. I learnt a lot, met some great people, made some good friends, watched people grow, and most importantly contributed to a great product. There were a lot of highlights, too many to name them all, but here are 5 I picked out. The whole team was respectful of each others ideas and skills, open to change and new ideas and a lot of fun. One of the first projects where change has not been outright resisted and refused. As consultants I can see that it’s natural that our presence on a team can cause hostility, but we’re here to help, honest! This lead to a much more productive and more pleasant working environment, allowing people to try new things and bring their ideas to the table. From the moment that I got there I felt like there was space for my ideas and people were ready to listen to them and give them a go. Wonderful feeling. It sounds like a small thing but its really not. When a team is willing to change the way it thinks and embrace new ideas, everyone can contribute to that success, it’s not just the persistent, rebellious people (which is often the role that ThoughtWorkers have to take) who can make change happen but there is space and support for everyone to have ideas and change the way things happen. Feature Leading. Our tech lead was comfortable letting some of us lead a few of the features, which was great. I got to look after the online sales feature we added and an emailing piece. It wasn’t so much as an official thing but more an organic thing. As well as being involved in writing the code, I helped with analysis, spent a lot of time talking to the teams that we were integrating with, kept an eye on and helped out with testing and deployment and generally provided a consistent technical vision for the whole feature. It’s great experience for people who are moving towards becoming a tech lead, without the pressure and responsibility for being the actual tech lead. I found it really energising to have such focus on one feature. I went to a leadership academy event recently where one of the speakers said that you are not a great leader unless you have pulled people up with you. That has really stuck with me. What kind of leader can you claim to be, if you haven’t helped other people learn and grow? The client had a female developer on their team who had never met another female developer before she met me. She is also very talented and passionate about technology with some great potential. I spent a lot of time with her coaching and mentoring, and this relationship will outlast the client engagement. I get a massive amount of satisfaction helping others reach their goals and look at the world in different ways. Also being able to provide the support that people need to grow. I also tried quite hard to make sure that I was giving “in place feedback” i.e. immediate feedback in a situation, mostly whilst pairing etc. One of the other TW Developers on the team commented that he heard me doing this often and learnt a lot from just listening. Need to do this more though. Especially when there are more “heated” pairing situations. A positive attitude can go a long way. Generally I’m a pretty positive person, and I got a lot of feedback about how this changed the whole atmosphere of the team. It only takes one consistently negative person on the team to start bringing the entire mood down. Remember this and try and look at situations positively and with energy. There is more to being a developer than just writing code for the story you’ve been given. As a developer, you are responsible for getting features that help the people using them into the hands of the people using them. It is your job to push back if you think requirements don’t make sense. It is your job to ensure that the software you are producing is of a good quality. You should not just be coding whatever you are told to without questioning anything. So as well as writing code, be part of the requirements definition, the testing, the conversations with stakeholders, with the people that are deploying your code if it isn’t you. Software that is not in the hands of the users and being used is useless. As well as advocating the above, I spent some of my time on the team championing and facilitating the retrospectives, launching lunch and learns, being part of the inception, and countless other things that weren’t strictly in the remit of a typical “developer”. For me this is normal as they are things that I enjoy, but I don’t think this was the kind of developer that many of the client devs had met before! I hope that it has influenced them a bit. …..and probably others that I can’t remember off the top of my head. I wanted to share with you a campaign that has been gaining traction in the UK recently. There has been a lot more media coverage of the lack of women in IT due to the launch of a new book. The ladies of Lady Geek have launched a campaign through their social arm to inspire young girls to become the next pioneers in technology, and to get the attention of the British Government. The founder of Lady Geek, Belinda Parmar has written a book called Little Miss Geek, to go alongside this campaign. Belinda Parmar charts the rise of the Little Miss Geek as she fights her way from childhood, through school and into the heart of the technology industry. Along the way the book outlines practical steps that will bridge the gap between women and technology, and help inspire girls everywhere to be tech pioneers. My copy of the book is currently winging it’s way to me, so once I’ve read it I will report back. Some parts of the campaign make me cringe slightly, there’s a lack of celebration of the achievements that women have had in technology, but their intentions are all good. I’ve had the pleasure of meeting and speaking on a panel with some of the ladies from Lady Geek, and they are full of energy and drive for making a difference in this space. They also do a great job of addressing how the stereotypes around a “typical IT worker” can be so damaging when attracting people into our field, which we know is something thats always bothered me! Women only make up 17% of the UK’s tech workforce and this has been falling by0.5% each year = we need to encourage more women to want to work in the tech industry. There was only 1 girl for every 11 boys in the average UK A-Level computing class in2011. Girls account for 56% of high education applicants but only make up 14% of Computer Science and I.T. subjects = we need to excite girls to want to study computing, so they are more knowledgeable about tech. 80% of women want creative independent job roles. Only 30% of women believe that tech jobs can provide such an opportunity = we need to change the negative perception women have about the tech industry. 4 out of 10 gadgets are now bought by women but only 3% of women are creative directors in this industry = we need women to become creators of tech and not just consumers. We hope to gain national Government awareness and backing, so the issue is taken seriously and initiatives are put into place to help get more females into the industry. We won’t rest until women make up 50% of the UK’s tech workforce. It was a great event, lovely to see such a vibrant and varied tech scene in London. There was a total cross section of people there too, from startup entrepreneurs to low latency Java devs to web developers. I did a short version of my Altering the perception of the Software Developer talk and was also on a panel discussing whether or not, but having female only technical events are we creating a “girl ghetto”. After the panel I was asked to be interviewed for a BBC 5 live podcast where I talked about why I became a software developer and about being a female in the tech industry. The Geek Girl Meetup section starts around minute 10 and I’m on at about 14.20. But listen to the whole thing! Giving and receiving feedback is something that I think is so important if you want to improve and get better. I am also a bit of a positive affirmation person. I can be so critical at myself that sometimes I lose sight of what is going well. I have to make a real effort to remember what i’m doing well as well as what I can do better. 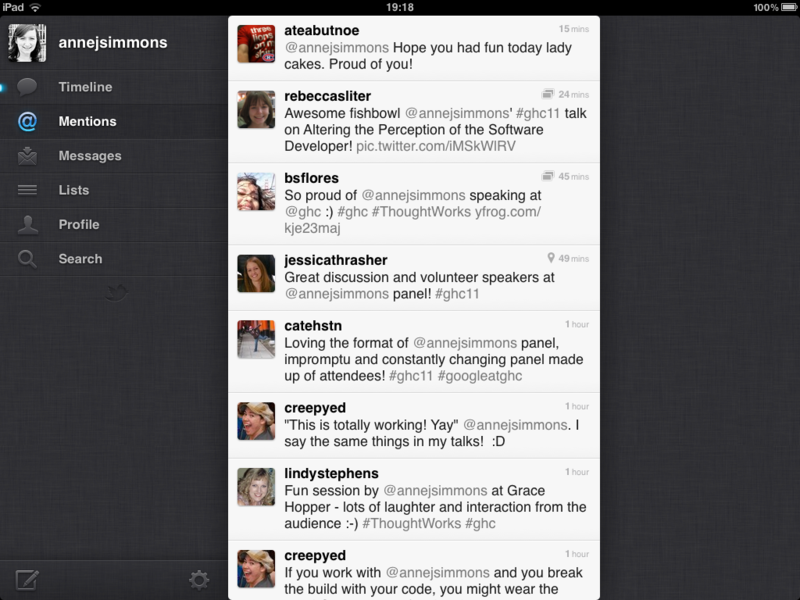 One of the great/scary aspects of being a presenter at a conference, is Twitter. Getting live feedback (or looking at it after the fact) is so powerful. I asked for feedback at the beginning of my talk and was so happy to see some of the responses. Here’s an example of some that I saved. I also just spotted the impact report compiled from the survey’s taken by attendees of The Grace Hopper Celebration of Women in Computing 2011. I was really chuffed to get a couple of mentions in highlights sections. First one up was from the lady that I mentioned in my post https://annejsimmons.com/2011/11/16/being-a-speaker-at-the-grace-hopper-celebration-of-women-in-computing/. I literally hunted down this woman during the party on the last night to thank her for what she did for me without even realizing. Always let people know and thank them if they make an affect on you. The next great bit of information was the ranking that people gave about the sessions they attended. Mine got a 4.30 which I’m pretty pleased with. The lowest of the “top six” sessions was 4.48 so not too far off at all. The last mention was of the format that I used for my panel. There was lots of great feedback on it from Twitter and also it seems it left an impact in the survey findings too. If only we’d had more than an hour. Definitely will have to repeat the format for next year! Over the last year, while researching and preparing for my talk on “What if we could alter the perception of the Software Developer?”, I came across, and people sent me, dozens of links to great articles. I’ve tried to categorize them into a few posts (more to come soon) so that it’s easier to find stuff. The ones below are mostly about the stereotypical developer, how it may not always be true, and also how once upon a time (in the 60s), females where the stereotypical developers. What A Computer Scientist Looks Like – Flickr group – What computer scientist women really look like! Researcher reveals how “Computer Geeks” replace “Computer Girls” – Article from Standford.edu summarizing the work of Nathan Ensmenger and how the earliest computer programmers were women and that the programming field was once stereotyped as female. The IBM Story and The Computer Girls? – From Nathan Ensmenger’s blog around his book The Computer Boys. I’m A Barbie Girl in a CS World – Nice slide show (bear with the pink..) on one woman’s foray into the developer world, also featuring Computer Engineer Barbie. Notes from my session can be found HERE . Thanks to Molly for taking notes and everyone else for participating! If anyone has video please let me know! I have just returned from a very hectic week at the Grace Hopper Celebration of Women in Computing which was held this year, in Portland, OR, and I am still on a high from being a speaker there. As a first time conference speaker, I was honored that they accepted my proposal for a birds of a feather session “What if… we could alter the perception of the “Software Developer”?”. More on how I submitted in a later blogpost. I found out that I had been accepted back in May, actually on my birthday! When I read the “Congratulations, you have been accepted…” email, I was so excited and proud of myself, I was literally jumping around my hotel room, whilst my boyfriend watched on waiting for my to realize what I had signed myself up for. Sure enough within minutes I was succumbed by dread. Now I have to actually write this thing, stand up in front of hundreds of people and not make an idiot of myself, I thought out loud. What definitely helped was the couple of practice runs I did beforehand. The first one I did on my client site, I was pretty nervous. The audience was mixed, some developers as well as other members of the team. I thought it went well. Got a couple of good pieces of useful feedback like “Anne that whole section where you talk about yourself breaks up the flow of the talk”. Noted. Swiftly removed. Two weeks before GHC I then did another practice talk but this time in my home ThoughtWorks office in Chicago. We had a bunch of candidates in that day and it was a Friday so there was a pretty large crowd. I knew they would be a supportive crowd so I definitely had a little less of the nerves. The new format worked well and it was the first time I got to really practice the fishbowl section of my talk. The format of my talk was 15min of me introducing the topic and then 35-40mins of facilitated brainstorming. I invited members of the audience to come out to the front to discuss and share, always leaving 1 of the 6 chairs open so that someone else could join the conversation, causing someone else then to leave. My aim was for this to be a “safer” environment than just asking question at the microphone, also for an ever-changing panel. I got some great feedback that the talk was fun, and interesting and also that I should remember to breathe. What normally took me 15mins to talk though I was done in under 10. Noted. Get one of the TWers in the audience to give me a secret signal when I’m going to fast. I won’t lie I was nervous and very quiet (very unusual for me) for the whole of GHC leading up to my talk, which was the last session of the whole thing. Thoughts of “Does anyone even feel the same way?”, “Am I imagining that this is a topic that people are interested in”, “What if no one gets up to talk?”, “What if no one comes?” “What if thousands of people come? !” were definitely rattling round in my head. While I was telling people about my talk whilst in Portland, I was amazed that people responded with “Ah yes, I had that one circled to go to!”. Blimy. I was even freaking out about what to wear. (Such a girl…) Advice….Power dress. Time for my session. I left the previous one where our CTO Rebecca was talking. She always does such a great job. Always blown away by how what she says makes complete and utter sense. At this point I won’t lie, I was petrified. I have to mention the amazing support I had from my co-workers. In particular Cassie, a great friend of mine. She visited the room I would be speaking in earlier in the week with me. My co-workers were prepared to get up on the stage and get the conversation started, they were trying to keep my calm… they had great words of encouragement and were smiling up at me as I got onto the stage. At this point something weird happened. I was overcome by a sense of complete calmness, no shaking, no nerves, nothing. I’m guessing my years at school in choirs and in drama on stage helped. I looked out at the 112 people watching me. Here goes I thought. I was blown away by the response to my talk. You know how they say, you should find someone in the audience who you can keep looking back to for reassurance, well there was a lovely lady that I didn’t know sat a few rows back that was that person for me. As I looked out at the crowd they were laughing, they were leaning forward in their chairs, engaged and enthusiastic. No one left…. In my head I was thinking “Oh wow this is working….”. When time came for audience participation people were literally running to get up on stage. Amazing. I wish I could put into words the feeling I had after getting down of that stage. People were waiting to talk to me. To tell me that I had inspired them, that I was a great speaker and it was great topic. I had a strange moment where I was hugging everyone who came up to talk to me. I was inundated with Twitter messages from people I had never met. My normal self-deprecating self was gone for a good few hours, infact it may still be gone. It was a HUGE adrenalin rush, and I’m so glad I did it. My friends I think were just as relieved as I was about how well it went. So. I tell you this ‘warts and all’ story, and no doubt am revealing too many trade secrets, in a hope that next year, you too are brave enough to submit something and hopefully get accepted to GHC 2012. The experience was unforgettable.